Transcribed by Bonnie Snow with permission from the Pendleton County Historical & Genealogical Society's News Letters. My deepest gratitude to our wonderful Historical Society! In 1859 William Madden (father of Joseph H. Madden), with Laban Mains and his sons, Oliver, William, Nich, and James; and William T. Baker (a half-brother to Joseph H. Madden); and Richard Madden, built the first church at Palestine, a log building; also James Wood, Henry Courtney and Robert Routt cut trees, hewed the logs and helped build the church, which was a combined church and school house. It was built right where the present frame church now stands. Rev. Bell was the first preacher there. Per memorandum by Joseph H. Madden, DeMossville, KY., 2 June 1937. Note: The original church was located at the corner of Reynolds and Milford Roads. The United Baptist Church of Jesus Christ at Palestine after its constitution on the 4th day of November 1859 at 3 o'clock, Bro. Barbee preached, then opened the door of the church. Then came forward Bro. William Madden and sister Nancy Madden his companion and was received by a relation of their Christian Experience and was baptized on the 6 day of November, 1859, by Bro. Stuard. The church met on the 5th of November and moved and seconded that a committee be appointed to go to Willow Church and call for the ordination of Bro. William L. Ragan for the pastor of Palestine. Names of members constituted into a body of brothers and sisters in the United Baptist Church of Jesus Christ at Palestine, Pendleton County, Kentucky on the 4th day of November, 1859 were: Mary Pickrel, Cordealia Hamilton, Hester Mains, Elizabeth K. Mains, Merah King, Margaret Mains, Sarah A. Bradford, James Hamilton, Ishmael H. Mains, Laban Mains, and Laban J. Bradford. Other people who it mentions joining the church in the first few months were: R. Wood, Gildroy Mains and Meriah, his companion; American Bradford, Cinda Ragan, Mary L. Boston, all baptized on the 5th day of March, 1860, in the Licking River by Bro. A. W. Mullins. In January, 5 joined by letter, Robert Routt and Margaret, his companion, Nimrod Routt and Mary, his companion, and John Mains. In February, John C. Mains was appointed the first deacon and Nimrod Routt his second deacon. Brothers L. Wood and Gildeeron (sic) Mains were appointed singing clerks. June 1860 - Bro. Laban Mains to write a letter of admission into the Association to be read at our next meeting on Sabbath preaching by Bro. Robert Elrod. At the July meeting Brother Ragan, Brethren John C. Mains, Nim Routt, and Laban Mains were appointed to bear our letter to the Richland Association and we sent 50 cents to pay for the minutes. Sept. 1860 - A motion there be a subscription in writing for signatures to fence the meeting house with planks. Nov. 1865 - Brother Laban Bradford was appointed treasurer and asked to collect the back pay money of 1863 the 14 months. July 1866 - To receive the letter to send to the association. Those who threw in for the minutes; (10 cents each) James Woods, Laban J. Bradford, M. Martin, James B. Hamilton and Laban Mains. Nov. 1866 - The baptism of Josiah Blades and Hesther A. Blades, his companion, was held on the Sabbath after our church meeting in November. June 1867 - Moved to turn Sally Madden out for dancing, she was excluded. Oct. 1867 - A charge against Bro. J. T. Hamilton for swearing on the 24th day of September. July 1868 - Committee to select a place for meeting of the Association and commence preparing the stand and seats on Friday and Saturday before the association. Joel Hamilton and Minor Martin vigilant committee to see that no intrusion of saloon or huxter. Messengers names: Laban Mains, L. J. Bradford and James B. Hamilton. Oct. 1868 - The baptism of Mary Boswell took place of the 4th Sabbath of Oct. at Hooks Mill in Bracken County, Kentucky. Dec. 1868 - Confession of Bro. Wm. Hamilton for dancing. Motion and seconded to forgive him. The church has forgave Bro. Hamilton once on the promise to do so no more. A charge against Bro. Edward Hamilton for dancing and swearing. Bro. Blades came and confessed intoxication and the church forgave Bro. Blades for getting intoxicted (sic). Feb. 1869 - Moved and seconded that each member of Palestine Church is to pay quarterly one dollar and fifty cents. April 1869 - The United Baptist did not meet at Palestine, but the Pastor was there at his post. Sept. 1869 - Did not meet but the pastor and two members present. Jan. 1870 - Laban Woods and wife dismissed for dancing. Committee to meet with Martha G. Hamilton concerning her dancing. Feb. 1870 - Motion that Bro. Samuel Mains be our clerk, that sister Martha G. Hamilton be forgiven and that Bro. Joel Hamilton be forgave. April 1871 - Bro. Laban Mains chosen moderator. Expelled Bro. Robert Bradford out of the church the 3rd Saturday in Aug., for profane swearing. Bro. N. D. Mains chosen deacon of the Palestine Church, Bro. John Bradford be forgiven for swearing. Sept. 1871 - At a meeting held at Palestine for two weeks by Elder Mason Owens there was 28 people added to the church. The baptism took place 1 Oct. 1871. Oct. 1871 - To fine any male member 10 dollars for sitting on the ladies side or reported to the grand jury. March 1872 - That Bro. James E. Mains care for the house and furnish the light for the Baptist only. That each member pay 50 cents for keeping the house and lights to be paid quarterly. That Levi Mains be appointed to collect the money for keeping the house and lights and pay over to James E. Mains. Oct. 1872 - To Release the committee to investigate the difficulty between Bro. Levy Mains and Bro. Joe Hamilton. To exclude Bro. Harden Rugles and Bro. Riley Simpson for attaching themselves to the Christian Church. Nov. 1873 - Moved by the church to exclude Thomas Miller for stealing a horse. Thomas Bradford and Miner Martin appointed to raise money to pay the pastor for the year 1874. Bro. Ragan selected to preach for the church one year. Feb. 1874 - A committee to invite the absent members that belongs to Palestine to fill their seats; Thomas Bradford an Wm. Ragan. John T. McKinney chosen to see the absent members and report at our next meeting. Aug. 1874 - To raise a committee to take subscriptions to build a church house at Palestine. Nov. 1874 - Appointed R. H. Browning as one building committee and that Bro. N. D. C. Mains act as treasurer for the church in building of the house. Aug. 1876 - First Saturday in August, 1876 at 2 o'clock in the evening as account of rain in the morning they could not meet at 11 o'clock. A few of the brethren met and after singing and prayer by Bro. Laban Mains, they went into business. Appointed N. D. C. Mains and F. R. Leay to solicit means to get doors and windows and select the help they wanted. 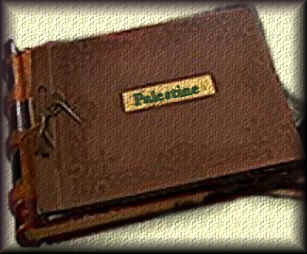 Feb, 1877 - Number of members at Palestine at this date Feb. 1877: Male members - 50; Female members - 59; Total - 109. Other ministers mentioned as preaching during this time were: Bro. Barbee in 1859, preached at the first meeting; Bro. W. H. Stuart; Bro. A. W. Mullins; Bor. Robert Elrod; Bro. George Marshall; Bro. Sanks; Bro. Mason Owens; and Bro. M. M. Arnold. Nov. 1877 - The United Baptist Church of Jesus Christ met at Palestine on the third Saturday in Nov.; Peace of the church was called for; References called for ....none; Moved and seconded that the Report of the Building Committee be read....carried; Moved and seconded that the seconded that the report of the building committee be received.....carried; Moved and seconded to adjourn. Jan. 1878 - Motion to appoint a comittey (sic) to see Bro. N. D. C. Mains and Bro. Martin VanHook together and try to settle a difficulty between them. Committee consists of Thomas Bradford, James Lucas, and Harry Fields. Motion.... that the money raised at the first festival be paid to Bro. J. R. Barbee on his labor as pastor for the year 1877, Bro. Thomas Bradford agrees to keep the house for the year 1877 for the sum of eight dollars. Feb. 1878 - Prayer by Bro. Laban Mains. Bro. Eliot Fishback elected moderator. Moved and seconded that the difficulty between Bro. N. D. C. Mains and Martin VanHook be dismissed outside the church....motion lost. Moved that Bro. Mains and Bro. VanHook, present their accounts to the church in writing....carried. To be presented at our next meeting. April 1878 - Motion to Exclude twelve members of which the names are as follows: Nicholas Hamilton; Luis Hamilton; Presele Hamilton; Robert Mattox; David Steward; Nicholas Martin; Andy Miller; William Smith; Alonso King; Thomas King; and Thomas Miller ....carried. May 1878 - Motion to Exclude John Routt, Edward McKinney, C. B. Brown and Joseph Norris. Special committee to see absent members: Sister Palmer, Sister Mattox, Sister Mariah Mains, and Sarah Courtney. July 1878 - F. R. Leay and James M. Mains on a committee to raise money to pay Bro. M. M. Arnold to preach the remainder of the year. Motion to appoint a committee to attend the church meeting in Falmouth to see if they can get seats for Palestine Church. Bro. Laban Mains, appointed. Delegates to bare the letter to the association: Thomas Bradford, J. M. Mains, Eliot Fishback, Wm. Miller, Laban Mains, and Wm. Palmer. Sept. 1878 - Committee chosen to get lumber for seats and seat the house and have house painted....carried. Committee appointed Wm. Dawson, James Wood, and James Lucas. Jan. 1879 - Motion to grant Bro. Thomas Bradford and wife and daughter a letter of dismissal....carried. Feb. 1879 - Bro. M. M. Arnold called as pastor. March 1879 - Bro. Thomas Bradford and wife and daughter returned their letters of dismissal back to the church at Palestine and welcomely received. April 1879 - Motion to Exclude Bro. William Hampton....charge...Joined Methodist Church...carried. Harvy Fields, S. A. Miller, N. D. C. Mains, committee to build a fence at Palestine Church House. June 1879 - Preaching by Bro. M. M. Arnold. A committee appointed to take up a collection for Sabbath School consist of Thomas Bradford, Harvey Fields, James M. Mains, and N. D. C. Mains. Aug. 1879 - Delegates to association: James Wood, Eliot Fishback, F. R. Leay, Thomas Bradford, J. E. Mains, and J. M. Mains. Dec. 1879 - Motion to Exclude Bro. Martin VanHook and wife, Melvinia, charge - joined Reform Church. June 1880 - J. E. Mains, committee to employ a carpenter t make seats for the church so far as the money and lumber will go. Due to be done by 2nd Saturday in July. Dec. 1880 - Bro. Ekler called as pastor for 1881. May 1881 - To Exclude Bro. Thomas Miller for drunkenness and swearing....carried. July 1881 - Letter granted to Bro. Joseph Blades and wife. Sept. 1881 - The church employed John Rice to seat the house at Palestine for the amount of $40 dollars....carried. To grant a letter to Bro. Edward Hamilton. Oct. 1881 - To move the pulpit from its present position to between the doors. Feb. 1882 - That the members who have neglected attending the Regular Church Meetings, be notified to come and fill their seats and failing to do so, that the church will exclude them. Aug. 1882 - To Exclude Bro. Edward Hamilton for no-attendance. Motion to accept the acknowledgement of Bro. Laban Wood and forgive him for swearing. Oct. 1882 - Vote taken for a pastor is unanimous for Bro. Mullins. Appointed a committee to wait on absent members: John Bradford, G. Mains, L. J. Bradford, Joel Hamilton, S. A. Miller, Thomas Bradford, J. T. McCarty, Wm. Palmer, Wm. Dawson, and J. B. Wood. A motion to exclude Bro. Adam Miller for profane swearing. Memorandum of a Meeting Commencing with the Church at Palestine, held by Bro. S. G. Mullins and James Hall, commencing on the 28th Oct., 1882, by Bro. Mullins and continuing until the 30th of the same month at which time Bro. Hall came to his assistance and they continued the meeting for a series of days and nights and there was added to the church the following: Mrs. Molly Wood, Mrs. Sarah Wood, Ishmal Wood, Mack Wood, John Mains, Miss Fanny Mains, Molly Routt, Lucy Routt, and J. B. Wood. This meeting closed on the 6th day of Nov. at night. The brethren and sisters above named was baptized in the Licking River at Waggoners Ferry on the 6 day of Nov., 1882, by Bro. S. G. Mullins, pastor. Jan. 1883 - Motion to exclude Miss Eliza/Elisa Atwell for joining the Reformers. Moved to call Willow Creek and North Fork and New Zion Churches to assist in ordaining deacon. March 1883 - Committee to revise church book found 7 names on the old book that was not on the new book. Names as follows: Eliza Parmer, Lucinda Mattox, Mary Luden Burg, Saley A. Maddon, Bell Grove, Faney Doggett and George Bent. July 1883 - N. D. C. Mains, Laban Woods, John Rice committee to take subscriptions to fence in church - either money, lumber or post. Sept. 1883 - Names to be erased from the church book for no attendance - Bell Grove, Saley Maden, Mary Luden Burg, Moley Taylor, Margaret Craycraft, Sarah King, Cathren Atwell, Faney Oldham, Clerendy Mattox, Mary A. Day, Jula A. McCarty, Mariah King, Sary T. Hamilton, Elizabeth Marten, A. E. Ramsey, Margaret A. Giford, Rhodey Frilix, Alice Nichols, Percilla Fields, Eliza Palmer, and Faney Doggett. May 1884 - Motion to raise the amount of $10 to pay balance on church lot. Granted Bro. Harvey Bishop a letter by his request. To Exclude Bro. Sweeden Miller for non attendance. Jan. 1885 - Motion to grant Lisibeth Luther and Bell Ramsey a letter of dismissal by their request. Feb. 1885 - Motion that the church pay Bro. Mullins, $84 dollars and all over that they can collect for preaching the year 1885. Dec. 1885 - Motion to elect Bro. John N. Mains for church treasurer and Alexander Mains for church clerk. Oct. 1886 - Move to exclude J. B. Wood, James Wood, Ismel Wood, Sanford Bruin for non-attendance, Thomas Smith for dancing, George Bruin for swearing, Nancy Polly, Tillie Hamilton and Ellie Courtney for dancing. March 1887 - Bro. J. R. Barbee called for pastor, pay not to exceed $75. Aug. 1887 - Sister Sally Cookendoffer came forward and joined by letter. Nov. 1887 - Motion to exclude: Alice Galloway, Rose Miller, Ellen Dawson, Nora Vicroy, A. J. Miller & J. O. Hardin....joined the Methodist Church, Liza Smith and Lucy Steward joined Reformers. Aug. 1888 - Delegates to the Association: Laban Woods, N. D. C. Mains, Wm. Martin, James E. Mains. Alternates: F. R. Leay, S. G. Mullins, Mack Woods, and Wm. Miller. Nov. 1888 - Church voted for E. J. King as pastor. At a meeting held with the Church at Palestine commencing on the 15th of September and continuing to the 29th Sept. 1889, there was added to the church: Willia Mason, Mat McKinney, Osker Shaffer, Caroline McCain, Willie Wyatt, F. N. Mains, Leslie Morris, Isaac McClanahan, & Robert L. Mains. Theses members were baptized in the Licking River, 29 day Dec. 1889, by Bro. E. J. King. Nov. 1889 - Motion to build a brick flu for the piping from the stoves. Jan. 1890 - Motion to grant Bro. N. D. C. Mains, Ministerial Licenses, granted. April 1891 - Committee to invite the deacons of the Willow Creek and North Fork Churches to be with us on the 3rd Sunday in April at the ordination of Bro. William Martin as Deacon. Aug. 1891 - At a meeting held with the church of Palestine, in August the following became members: Sarah F. Browning, Josie King, Leana McKinney, Lucy McKinney, Annie McCarty, and Mrs. Hulday McKinney. March 1893 - Motion to exclude the absent members namely: Gildroy Mains, T. B. Fralis, Frank Vanhook, Geo. Baley, ___ Hamilton, Nan Mason, Mat McKinney, Lesly Morris, Isaac McLahan, and Joseph McKane. June 1893 - Motion to grant to William Angel and wife a letter of dismissal, motion lost. May 1896: J. Mains and Wm. Miller were ordained as deacons. March 1897 - Motion to appoint a committee to wait on brother Frank Courtney and tell him to come forward at our next regular meeting and make some acknowledgement of having play partys. Dec. 1897 - To accept Bro. Learys resignation as church clerk and Bro. Henry Mains be appointed. Dec. 1898 - Bro. Race was called for pastor for the year 1899. Feb. 1900 - Motion to exclude Bro. Brack Ellis for disorderly conduct. Sept. 1900 - Motion to grant Bro. Alexander Mains a letter. Bro. Race was still moderator. Sept. 1900 - The Church met at Palestine on Saturday before the 3rd Sunday at 3 o'clock, P. M. after singing and prayer the church proceeded to business. Motion that Bro. Rice act as moderator. Messengers to the Association were appointed: C. Rigg, H. H. Mains, John Hamilton, and J. M. Mains. Nov. 1900 - Bro. William Martin, moderator. Bro. E. J. King called to pastor for 1901, but rejected the call. March 1901 - Bro. C. J. Bagby was called to pastor. May 1901 - Motion to restore Br. W. E. Hamilton and Bro. J. M. Mains and wife and granted them letters. No more meetings were held during the year 1901 until Nov.
Nov. 1902 - Wm. Martin moderator and H. H. Mains, clerk. The church voted to call Bro. F. M. Marshall as pastor. Jan. 1903 - Motion to restore Martha J. Wood and Rosa B. Mains. John Hamilton was elected as a deacon. March 1903 - Received report of committee to buy shingles and cover the church house and to build two brick flues in the church house. July 1903 - Motion to restore Sister Cap Courtney. Aug. 1903 - Motion that J. E. Mains, pay $2.75 left over from covering the church house to the treasurer. Thanks to Bro. Mains for his work. Sept. 1903 - Motion to restore Sister Annie Wood. Motion to employ W. M. Mains to keep the church house for the year at $15.00 and a committee of Fannie Mains, Nan Hamilton and S. C. Mains to raise money. Dec. 1903 - Bro. F. M. Marshall was called for pastor. Motion to receive Bro. Joseph Blades und (sic) the watch care of the church, carried. Feb. 1904 - Motion to withdraw Br. M. M. Hamilton for joining another Church. Committee to raise money to pay pastor: F. R. Leay, John Hamilton, Dr. C. Rigg, Sister Fannie Mains and Sister Eva Mains. Nov. 1904 - Br. F. M. Marshall called as pastor. Motion to grant Bro. J. A. Browning a letter. Jan. 1905 - To forgive Bro. J. R. Mains for having a dance at his house. Oct. 1905 - Business meeting called to call a pastor. (F. M. Marshall was evidently called as the next year's meetings were called by Br. F. M. Marshall). Jan. 1906 - Motion that Bro. F. M. Marshall, Bro. J. E. Mains, Bro. John Hamilton, and Bro. H. H. Mains. write a letter for the chairman of the Board of the Committee of the Association on regard to help for the church. April 1906 - Motion to appoint a committee to invite the Board to meet with us. Committee: Bro. F. M. Marshall, John Hamilton, W. R. Sharp, and H. H. Mains. May 1906 - H. H. Mains elected treasurer to receive Mission Money. Aug. 1906 - Motion to grant Bro. Joseph Blades a letter of dismissal. Committee to raise money to fix church house: J. L. Mains, W. M. Mains, John Hamilton, and Bennie Mains, and J. A. Browning. Oct. 1906 - Motion to appoint a committee to make a calculation of the cost of fixing the house. Committee: Charley McKinney, H. H. Mains, and J. E. Mains to report on Saturday before 4th Sunday. Jan. 1907 - Motion to employ Hewie Sharp to keep the Church house for 1 year at $12. Committee to raise money to pay Bro. F. M. Marshall for 1907: Eva Mains. Gracy Mains, H. H. Mains, and W. R. Sharp. Aug. 1907 - Bro. Bennie Mains elected deacon. Delegates to the Association: Br. John Hamilton. W. R. Sharp and J. E. Mains. Sept. 1907 - Motion to exclude Bro. Jessie Fields and sister Ora Mains for joining another church of a different faith. Motion to grant Bro. Allun (sic) Rigg a letter. Oct. 1907 - To exclude Bro. Virgil Cummins for joining another church. Motion to loan one dozen song books to sister Mattie Ross. Nov. 1907 - Called a meeting Sunday night to ordain Br. Bennie Mains as deacon and selected council namely: Bro. W. A. Race, Rev. Daugherty, Bro. F. M. Marshall, and Bro. John Hamilton. Dec. 1907 - Bro. J. B. Woods appointed as Treasurer, to elect H. H. Mains as house keeper and Nan Hamilton and Sos Rachel Mains as committee to raise money to pay housekeeper. Jan. 1908 - To receive paint for the church house and pay sum of $12.00 to H. H. Mains for same, also $2.15 for paint. Nov. 1908 - Bro. McMillan called as pastor. Jan. 1909 - The church accept Bro. McMillan in regard to preaching for the year 1909 provided they can raise the amount of $96.00. The church pay Bro. J. B. Woods out of penny collection for remainder on house keeping. Motion to grant sister Rosie V. Wilson a letter of dismissal. Feb. 1909 - The church failed to make the amount asked by Bro. McMillan. The subscriptions list for Bro. McMillan be destroyed and money refunded. Nov. 1909 - Bro. Mangold called for pastor for year 1910. Jan. 1910 - To exclude Bro. Walter Boles, Verna Cummins, and sis Lona Fields for joining another church. May 1910 - No meeting on account of absence of pastor and clerk gone to the city. June 1910 - To grant sisters, Harrie Bishop and Lizzie Galloway letters. Aug. 1910 - Delegates to the Association: Bro. Mangold, J. B. Woods, John Hamilton, Bennie Mains, Hughie Sharp. Elsie Blades, and Eva Mains. Dec. 1910 - Bro. Mangold accepted call for another year as pastor provided they pay him $100.00. Committee to raise money for pastors salary were J. B. Mains, Bennie Mains, Hughie Sharp, Elsie Blades, and Eva Mains. March 1911 - Reading of Bro. George Galloway's letter of recommendation from Willow Church received. April 1911 - The church prefer a charge against Bro. Vickroy and wife and daughter for disobeying church rules in general. May 1911 - Report on Bro. Vickroy and family, Bro. Vickroy admits he has done wrong and will come to church at his first convenience. June 1911 - Brother Vickroy, wife and daughter to be excluded for disobeying church rules in general. Nov. 1911 - The church called a pastor for 1912 by secret ballot. Bro. Thornton was unanimously called. Jan. 1912 - Finance committee failed to raise money for pastor. Bro. Thornton wrote not to consider him any further. Feb. 1912 - Bro. Nelson Bradford called for pastor. Bro. Grant Mains restored to the church. Dec. 1912 - Bro. Sharp made a report in regard to Bro. Lige Fields and said Bro. Fields promised to be have but has not. Committee appointed to raise money to pay Bro. Bradford: Bro. Grant Mains, Lish Sharp, F. R. Leay, Sis. Mollie Mains. Annie Woods. and Mamit Gillespie. July 1913 - Reading of a letter from a church in Indiana for help to pay for church house. Amount collected $1.00. Oct. 1913 - To withdraw the hand of fellowship from sister Martha Lucas, Bennie Boles, Liza Yelton, Della Linum?, Miss Martha Woods, Ike McClanahan, Cap Courtney, Icie Courtney, Dove Bloom, Emma Whittaker, Mary G. Martin, Hallie King, and Harry King for violation of Rule No. 17. (Rule No. 17 that each member communicate with the church at least once in each six months.) The minute book shows no more meetings until August 1914. Aug. 1914 - The church sent the Association $7.75 by delegates, J. A. Browning, Annie Wood, and Nancy J. Mains. May 30, 1915 - An all day meeting was held at Palestine with dinner on the ground. This meeting was gotten up by N. D. C. Mains and J. E. Mains in memory of 50 years ago when they came home from the war and there was church at Palestine that day. Bro. Mangold preached on this last occasion in Morning, Isa. 45:22. There were 5 present that were there 50 years ago, namely, James A. Browning, Sarah C. Mains, Sarah S. Mains, and Nancy J. Mains. This was also Decoration Day. Jul 1915 - Bro. Vincent began a two week meeting and the following members were added to the church by baptism: Richard Norton, Willie Traylor, Job Elliott, Roy Elliott, Fred Elliott, Sidney McKenney, Alice McKenney, ____Elliott, and Janie Harberer. Sept. 1915 - To withdraw the hand of fellowship from Bro. Willie Trylor for joining a church of another faith. Oct. 1915 - Brother Vincent called to preach for another year. Aug. 1915 - Motion to grant letters of dismissal to Bro. B. F. Mains, Sister Rachel Mains, Eva Mains, J. L. Mains, Sister N. J. Mains, and Bro. W. S. Gillespie.